The Dow's downward conclusion on Friday proved to be a frightening catalyst for jittery international markets. Futures markets also suffered on Monday. Wall Street took the day off. But concerns about European woes did not take a holiday. Nor did worries about jobs. "When you have high unemployment, you also are gonna have consumers who are afraid to spend," said UCLA Economist Daniel Mitchell. "Investors are afraid to invest." 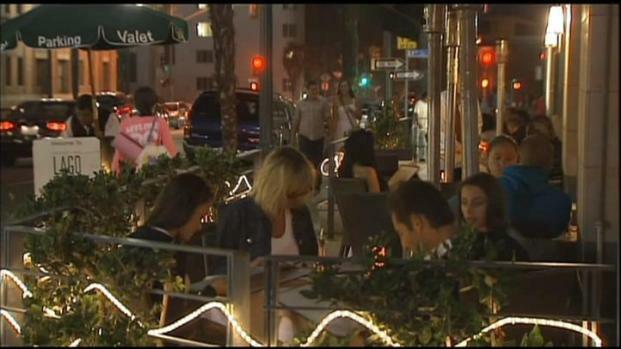 The result is an economic slowdown that's even being felt in recession-proof Santa Monica. Friday was a bad day on Wall Street. Monday, investors wondered what Tuesday would bring. "I don't want to say abysmal, but it's not looking good," said Santa Monica resident Janet Shuda. The four letter word on most lips these days is jobs. Some industries have them, and some businesses are bucking the trend by prospering. "Today we have the business and we know what we have," said J.D. Kessler of Locanda Del Lago Restaurant. "That's the easy part. But predicting the future is more difficult." After nearly a billion dollars in federal stimulus, job growth nationally has been hard to come by, and even harder for a politically divided Washington to create. "We leveled things out but we didn't really ah promote a recovery," said Mitchell. President Obama will step before the cameras and a joint session of Congress Thursday to pitch his latest jobs plan.. People on the street already know what they need to hear..
"Overall I think he needs to be saying there's more jobs being created in America," said Tate. "I think he wrote out a good plan and he just needs to stick to it," said Ron Weaver of Gardena.